IN the beginning man scratched in the earth with a stick. This method had its limitations. While he could share information with those standing next to him, he was unable to share that information with neighboring tribes, and he experienced the devastation of lost data every time it rained. Things didn’t improve much with smoke signal technology either – information could be shared with neighbors, but again, the rains made data transmission impossible. Fast forward a hundred thousand years or so and Man invents the computer, complete with a tape backup drive which he even occasionally uses. Seeing how useful the computer was at work, Man decided he could improve upon that by bringing the computer home, where he would be available to work 24/7 instead of the mere 8 hours a day he was accustomed to. The Man’s family, seeing how enjoyable it was to watch the Man work (and play Pong), requested an additional computer, which the Man brought home and connected to the first computer, and voila! the Home Area Network (HAN) was born. From its humble beginnings the HAN has evolved from a simple “peer-to-peer” wired network into a Local Area Network (LAN), a complex wireless array of computer devices that route information and connection data from device to device at a higher rate of speed than anyone who ever used a Commodore 64 dared dream possible. While manufacturers of devices like modems and routers work continuously to enhance those devices’ capabilities to accommodate the ever-growing list of connected things (remember our recent article on the Internet of Things? ), until recently very little if anything was done to resolve the “dead zones” within our homes. Due to our homes’ architecture and electronic “noise” from various electric appliances, signals sometimes simply cannot get through and the internet connection is frustratingly lost. Again and again. Although it is possible that upgrading your router to the newest, most powerful model may solve that issue in your home, due to architecture and construction materials, that alone may not be adequate, and this is where the “Mesh Network” takes the evolution of the Home Area Network to a revolution. Imagine a swatch of wire mesh with a round “node” at every intersection. There you have the basic idea of the Mesh Network. “In a wireless mesh network, the network connection is spread out among dozens or even hundreds of wireless mesh nodes that “talk” to each other to share the network connection across a large area.” The nodes are programmed with software that tells them how to interact within the larger network, with information travelling across the network by hopping wirelessly from one node to the next. They are so smart that they automatically choose the fastest and safest path by a process called “dynamic routing.” The nodes are also “self-healing” in that if a node is blocked or has lost its signal, the network will automatically find another reliable path to send data. If a node is added to the mesh network, the network will “self-configure” to automatically incorporate the new node. A great thing about the wireless mesh network is that the nodes are easy to install and uninstall, which makes the network very adaptable – it can easily be expanded or reduced as coverage requirements change. Today’s typical router provides a coverage area of about 2,000 square feet (which may leave your basement or pool area outside of the covered area), but a wireless mesh network can easily provide up to 20,000 square feet of seamless coverage, and can even be expanded beyond that. A computer is a complex combination of electronics and mechanical parts. To keep your computers healthy they need to be maintained, serviced, and when they fail, will need to be replaced. Computers do not need to be disposable. With the following tips, you can keep your computer healthy longer. Computer fans need to be cleaned – regularly. You would not believe how much dust collects especially if you have pets in your house. It is important to clean your fans annually (at a minimum). Laptops do not mix well with liquids no matter how careful you are. A tiny spill is all it takes to ruin your keyboard and possible make its way to the motherboard or hard drive. Antivirus software is necessary to keep your computer healthy – Even if you know what you download, it could still contain a virus. Do not pull on the power cord. Tugging your power cord out from the socket rather than pulling directly on the plug can cause the cord to break off from the plus or damage the power socket. Avoid rapid temperature changes. For example, when bringing your laptop indoors during winter let it warm to room temperature before turning it on to avoid any potential for damage to the disk drive from condensation forming inside the machine. Keep all of your installation disks and product keys. These will be helpful if you ever experience a time where you need to reinstall. Restart your computer every few days. Shutting down or restarting your computer will help with overall computer performance and speed. Backup your data! Be sure to keep your important computer files and pictures in TWO places. A data backup solution is cheap insurance for the inevitable hard drive failure. What are you doing for your computers? Computer Troubleshooters is now offering an affordable worry-free service plan that will keep your PCs healthy, working like new, safe, backed-up and updated. Click Here for more information. Note: You do not have to be part of a service plan to use our service. We offer a variety of services to fix your PC’s. Newer and faster laptops, phones and tablets are being released every day it seems, but what are we supposed to do with the outdated devices we no longer want to use? The security of proprietary and personal information and environmental issues are the primary concerns when disposing of unwanted computers. Here are some guidelines we recommend when phasing out computers from your business or home. When you delete a file from the hard drive, the operating system only deletes the information that describes where the file is located. Simply deleting files, emptying the recycle bin or reformatting the hard drive is not enough to cover your digital tracks. In addition to documents, photos, videos, and private information that is accessible on your computer; there is also your Internet browser’s cache, cookies and history; email contacts and messages; and the recycle or trash folder. Don’t take a chance with the security of your business and personal information. Our Computer Troubleshooters technicians can complete any of the following strategies when trying to secure your personal information on an old device. The most cost-effective and commonly used strategy is the use of a software utility that overwrites the hard drive with random characters and binary data anywhere from three to more than 30 times. These utilities are typically referred to as data destruction software, hard drive eraser software or disk wipe software. Another effective but more costly solution is degaussing. This is the erasure of information through the use of a powerful magnet. Degaussing disrupts the magnetic domains on the drive, which erases your data while also rendering the drive permanently unusable. The physical destruction of a hard drive is the only way to absolutely and forever ensure that the data is no longer available. There are contractors who will perform this task on site, using the appropriate tools and safety precautions. We do not recommend this type of hard drive destruction by consumers. Extending the computer’s lifespan through re-use provides the highest environmental benefit. There are many donation programs that bridge the digital divide by providing schools, non-profit organizations, military personnel, low-income families and students with needed technology. If your computer is less than five years old chances are it can be put to good use. Most organizations have specific technology needs, so inquire in advance regarding donation guidelines. Most charitable contributions are tax deductible and computers are no exception. Business donors can generally deduct the un-depreciated value of the computer and individuals can deduct the current market value of a computer. Remember to retain your receipt for tax records. Consider donating your unwanted computer to a refurbisher who is equipped to repair and upgrade older computers. Certified refurbishers ensure that equipment works well and will pass on ready-to-use equipment at little or no cost to individuals and organizations. It is recommended that you remove your hard drive from any system that you donate to a refurbisher to ensure the security of your data. 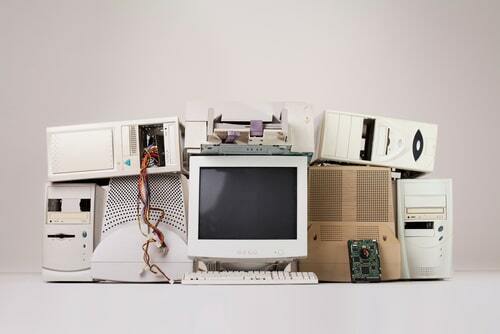 Even if a computer cannot be reused or refurbished there are reputable technology recyclers that can ensure valuable raw materials are recovered from old computers and that any waste is disposed of in an environmentally-safe and responsible manner. Let us do all the work for you. Our technicians are trained experts in making sure your personal information is secure and responsibly disposing of unwanted devices.